This voices-only special edition album brings the edge of rock and roll, and the power of ensemble vocal music, to the best time of the year - the holidays! 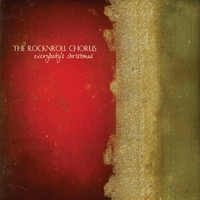 Everybody's Christmas is the first full-length Holiday album for The RockNRoll Chorus. RNRC uses only voices and strong, healthy vocal technique to create the sounds and 'feel' of some of the greatest songs of all time. RockNRoll Chorus recording artists manipulate vowel sounds and consonants, and capitalize on traditional and non-traditional blending techniques to re-create familiar and legendary songs as authentically as is humanly possible. RockNRoll Chorus music certainly embraces technology and recognizes recorded music as its own Art form, as opposed to the most common goal of recorded vocal music: simply capturing a live performance. However, humanistic reality is the priority and is present on all tracks and songs. No synthesizers, drum machines, vocalizers or samplers have been used, nor has any voice been injured, in the making of this record. It is high-energy, full of heart and soul, and leaves you amazed at what the human voice and the power of a team, with a rock and roll attitude, can create!